On October 27 last year, the Punjab Chief Minister, Capt Amarinder Singh, described as “nonsense” the events leading to the arrest and harassment of family members of the petitioner in the DSP selection case. Punjab may be having beautifully designed, plush houses but the demand for course in architecture in the state seems to be low. At least the statistics available from the Punjab Technical University counselling centre are a pointer to this. Confusion prevails among the Food and Civil Supplies, Police and Health Department officials over test reports of fake ‘Nova Desi ghee’ seized from Pathankot. The preliminary magisterial inquiry into the boat tragedy has established that the ill-fated boat that capsized in the swollen Sutlej was in had shape. The local District Transport Office and the police heaved a sigh of relief when a team of the Special Task Force from Uttar Pradesh found no clue to link Ayodhya attack with Amritsar. If Babbars had so much RDX, why didn’t they strike? A showdown between the Kisan Beopari Mazdoor Sangharsh Samiti and the district administration at Sriganganagar, 40 km from here is likely as the District Magistrate Mr Kunji Lal Meena enforced prohibitory orders under Section 144 keeping in view a ‘chakka jam’ call given by the samiti tomorrow. Social activist Balwinder Singh Saifdipur, who has opened a string of free rations shops across the town, has hailed the appointment of Mr Shamsher Singh Dullo as president of the Punjab Pradesh Congress Committee. Long vehicular traffic queues at the busy DAV College railway crossing may soon be a thing of the past as the Punjab Local Bodies Department has directed the local Municipal Corporation to get the much-needed overbridge constructed within one year. Jalandhar city has over 235 illegal and unauthorised residential colonies, most of which have either been half-developed by influential private colonisers or are bereft of basic facilities like roads for years. Resentment prevails among doctors and paramedical staff of the Civil Hospital here as they are being forced to bring persons for vasectomy. As per a circular issued on June 27, by the SMO, they were asked to bring a certain number of vasectomy cases to hospital otherwise an action, will be taken. 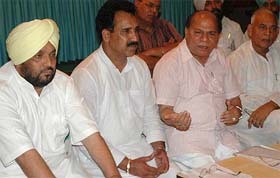 The election for the posts of the chairman, the vice-chairman and a special representative of the SAD-dominated Doaba Cooperative Milk Producers’ Union dashed into rough weather once again as all elected directors of the union belonging to the SAD staged a walkout in protest against the effort of the Union Management to include six “non-voter” members in the election. The British Government has informed the Indian Exservices League, Punjab and Chandigarh, regarding the denial of compensation to those prisoners of war PoWs of the Indian Army who fought in the World War II and maintained that the Indian Government was not a party to the 1951 Peace Treaty but reached a separate agreement with Japan in respect of matters arising from the world war. The first ever-inter-faith symposium will be held at Lahore’s famous Al-Hamhra Convention Centre from November 12 to 22 where scholars and leaders of all world religions will make presentations and lead discussions on the universal teachings of Guru Nanak Dev and its impact on the inter-faith understanding and harmony. The Punjab Civil Medical Services Association today demanded fresh recruitment of doctors in the PCMS cadre without any further delay to end resentment and frustration among unemployed MBBS doctors and to improve the health services in the state, particularly in the rural areas, where 1374 posts were lying vacant in the cadre. It was a surprise for farmers of nearby villages, Rurrka-kalan and Ghurrka, in Phillaur subdivision when the Punjab State Electricity Board Member (Operation), Mr B.K. Bindal, along with the Chief Engineer, North, Mr N.K. Arora, and the Superintending Engineer, Mr Subhash Kumar Sabharwal, met farmers to hear their problems. A youth, Kapil Saini, of local Gobindpura Mohalla today alleged illegal detention and torture by the police. However, when contacted, DSP Navjot Singh denied the allegation. Two persons were killed, while Mr Ajaib Singh, manager, Darbar Sahib, is among three injured when their Indica car collided head-on with a bus belonging to the Himachal Pradesh Road Transport Corporation (HP-36-0380), near Kathunangal, about 20 km from here, today. The Northern Railway has decided to provide mobile phones to train drivers, guards and station masters of railway stations concerned to prevent rail mishaps and activate their efficiency. 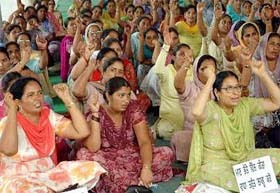 Protesting against the non-fulfilment of their long pending demands, members of the Anganwadi Mulazim Union held a state-level rally at Desh Bhagat Yaadgar Hall here today. Mr Justice S.K. Goyal of the Punjab and Haryana High Court, while entertaining CRM 36763 filed by Mr Jawahar Lal has issued a notice to motion to the SSP, Ferozepore, and SHO Police Station city here and fixed the hearing for August 25. The Punjab Judicial Courts Personal Staff Association has demanded implementation of the recommendations of the first national pay commission, which was headed by Mr Justice Jagannatha Shetty. The Malerkotla police has arrested Chaudhry Mehra Deen, an Akali activist in connection with a fraud case registered against him. Mehar Deen was sent to one-day police remand today by the Subdivisional Judicial Magistrate. A quarrel between husband and wife led to the consumption of some poisonous substance by both of them. While the woman died yesterday, the man is struggling for life. The local police has confiscated 35 kg of poppy husk and willow bats worth Rs 13 lakh that were being smuggled into Punjab from Jammu and Kashmir. Interestingly, such a large number of bats and poppy husk had crossed the checking barrier at Lakhanpur in Jammu and Kashmir. Mr Arun Pal Singh, SSP, stated in a press note here today that a murder case was solved by arresting Sandip Kumar and Jaswinder Singh. They allegedly murdered Amrik Singh of Jhingra village last night. Arjun Chawla (19), a resident of Katra Sher Singh, has been missing since April 13, the police has allegedly failed to register an FIR. Ms Tina Aggarwal, sister of Arjun, said that his Kinetic scooter was found abandoned outside Goal Bagh parking on the same evening. Three persons were held for illegal selling of diesel and sale of adulterated diesel in separate cases here today. One accused is still absconding. Police sources said a police party led by CIA Inspector Kuldeep Singh got information that driver Charanji Lal and cleaner Gora Lal were supplying diesel to various pumps after loading their tanker from a depot in Jassi Po Wali village. The police has arrested two members of the inter-state gang of truck thieves. They have been identified as Baldev Singh and Hardev Singh. The accused along with three others used to steal trucks from the other states and sell them. Guru Nanak Dev University in an important decision today has allowed students, who had been placed under compartment or reappear in their 10+2 examination, to take admission in BA/BSc Part I courses in its affiliated colleges for the current academic session. A literary competition for children was organised at Government Girls Multipurpose Senior Secondary Model School here today as part of a talent hunt drive launched by Punjabi Tribune. Hundreds of activists of the Unemployed Elementary Teachers Union today burned the effigy of the state government near the local bus stand to lodge their protest against the state government for not implementing their already accepted demands. Continuing their protest against the arrest of youths in Ludhiana, members of the Unemployed Elementary Teachers Union burnt the effigy of the Punjab Government outside Desh Bhagat Yaadgar Hall here today.